I’ve been doing a lot of pruning around the place lately, and had a substantial brush pile for pickup on our recent Compost Day. Most of the pruning and trimming was done either with feet on ground or from an 8-foot-tall stepladder. Not, unfortunately, one of those elegant three-legged numbers used by professionals, but an orange fiberglass and aluminum one intended for the handy homeowner. In most places it worked well, and is just light enough that I can lug it around and position it properly. My cutting tools — secateurs, loppers and scimitar-shaped pruning saw — also worked as expected. Near the end of the job, I tackled a relatively small but (when fully leafed out) shade-creating branch of the Tree of Heaven (Ailanthus altissima). I had an idea I could remove it by deploying the pole pruner. Most of the time, this tool stands unused in a corner of the shed. Once more I have been reminded why. In theory, it’s a marvellous thing — a 5-and-a-half-foot-long telescoping pole that may be extended to 10 or so feet, with both a clipper and a saw blade at the end. The clipper is operated by pulling on a long cord (wrapped around the pole when not in use, as in the photo) that works a spring-loaded device attached to a blade-and-hook arrangement similar to that found on loppers. The gardener may stand on the ground (or, if desperate and daring, on a ladder) and cut otherwise unreachable branches. In theory. Slick, eh? Except the damned thing is virtually unusable, especially when fully extended. For one thing, it’s fairly heavy, with the cutting equipment on the end accounting for a good portion of that weight. It’s hard to finagle the hook over a branch at the correct angle and then hold the tool with one hand while pulling the cord with the other. The cord is long and hard to manage. The cutter can’t easily cut branches thicker than half an inch in diameter. That leaves the saw blade, which is about 9 inches long, but it’s impossible to saw a branch that’s bobbing up and down and can’t be held steady because it’s out of reach. Thus the saw is usable only to cut branches fairly close to a trunk or thick branch. My pole pruner gets a one-star rating — or, if you prefer, a multi-#*%! rating. To anyone who has been contemplating a pole pruner as a solution for pruning out of reach vegetation, I would say — don’t. At least not a heavy two-tools-in-one thing like mine. I think I’ve seen pruning saw blades attached to long wooden poles, which are probably a lot lighter. The limitations I’ve already noted would still apply, though. All in all, I would recommend a good ladder, and if that won’t do the trick, note the real problem branches and hire a professional to deal with them. After an epic battle with tree roots — a whole network, from 1/4 to 3/4 inch diameter, with sponge-like wads of feeding roots — I prepared a spot for a plant new to the garden: papyrus! Specifically, Cyperus papyrus “King Tut.” It now resides in a small boggy area next to the pond. Although a dwarf variety of the famous plant used in Egypt, it’s supposed to reach 4 or 5 feet. It’s not frost-hardy, of course, but I understand it’s easy to root new plantlets by inverting the flower stalk in water, which is what happens naturally as the plant dies down. The small plants may be wintered indoors and set out the following spring. Added to my garden tool kit this week is a Hori-Hori Knife, a tool which originated in Japan, and combines features of a knife and a trowel. Its original purpose was plant gathering in the wild. It’s a formidable thing, with a thick blade and sharpened edges, one of which is serrated for root cutting. Suckers, look out! Hori-hori knife and its sheath. While all this was going on, the hybrid tea rose “Fragrant Cloud” opened two of its six buds to perfection. It is truly well-named, exuding an intense, true rose fragrance. The plant is a scrawny, feeble-looking specimen that lives in a large pot. It had a bad case of black spot earlier this spring, which totally defoliated the old wood, but put out new growth that is free of black spot, and six buds. Weeding season is almost over, or should be. Actually, it’s never over, but I mean the main spring weeding effort, which, if done promptly, can save the gardener a lot of work and worry later on. Spring is the ideal time to extract most annual weeds before they bloom, set seeds and multiply. It’s also a good time to deal with perennial weeds, while they are in the early stages of growth and easily seen. In an earlier post, I noted that it’s helpful for gardeners to recognize plants at the seedling stage, so they can remove them if they are weeds or nurture them if they are desired plants. Keeping that in mind, here are some tools and techniques for removing the unwanted. Tools range from small and surgical (a one-prong cultivator that used to have three prongs, the usual three-pronged version as well as a three-pronged hand-fork, a nice little hand-hoe with a very sharp blade, the ever-popular dandelion tool) to large and crude (hoes, mattocks and the like, which I hardly ever use in my crowded beds). The main thing is to decide whether you want to extract or merely cut. Cutting works for masses of small seedlings. The sharp-bladed hand-hoe is just the thing for slicing their roots just below the soil surface, but care is needed to avoid desirable plants, which can be decapitated along with the weeds. 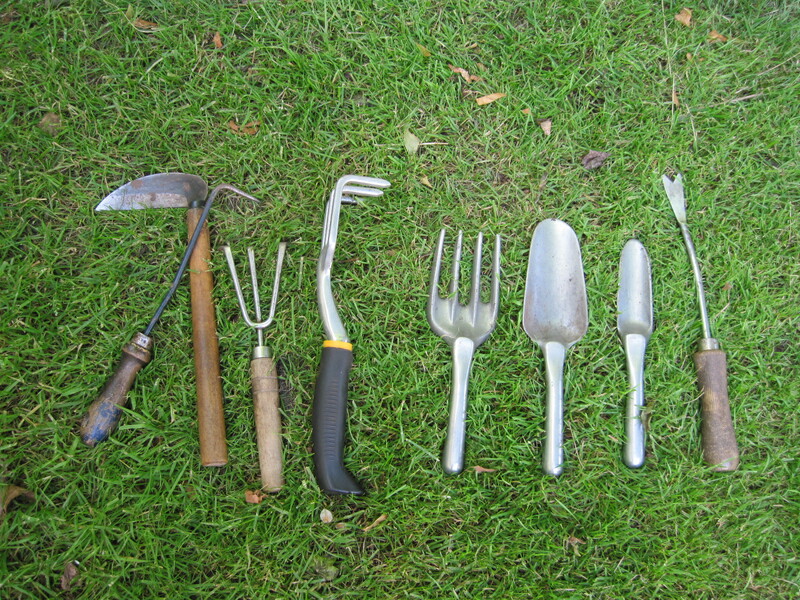 A different set of tools is needed to penetrate the soil as far as a weed’s roots go, in order to loosen it to the point that the weed can be extracted intact. The dandelion tool is an example of this, but the sad truth is that I never get the whole root. Removing at least some of it does in the dandelion for that season, however, and prevents blooming and seeding. Repeated hoicking, moreover, weakens the plant to the point where it eventually gives up. I have reduced the dandelion population in my lawn to almost nothing this way, even though dandelions bloom merrily in the yard next door. Weeding teaches one how to weed. After a few sessions, you recognize which weeds can be pulled up by yanking on their tops and which need to be dug out or pried up. The main thing is to do this work before the soil dries and hardens and taproots become immovable. That’s by the end of May in my garden, but a lot depends on soil type (clay is always difficult) and amount of rainfall. Tardy gardeners need desperate measures for when things are getting out of control: if weeds haven’t been pulled out before blooming, at least cut off the developing seed heads. Even if the seeds have ripened, you can carefully cut off the seed heads, depositing them into a bucket. Resign yourself to the fact that some seeds will be scattered during this procedure, resulting in seedlings next spring. And it goes without saying that you don’t put the seed heads into the compost heap, unless yours is a hot heap. (Mine isn’t). Finally, know when to admit defeat and negotiate. Some weeds are invincible and you just have to learn to live with them (or move). Nearly every summer, I find myself pulling masses of small bindweed (Convolvulus arvensis) out of the lawn — not to remove it permanently; there’s no hope of that — but as an act of cosmetic desperation, simply to get rid of as many of those screaming white flowers that stand out wonderfully against the by then brown lawn. There’s something slovenly about that scene, like dust-bunnies chasing each other around the kitchen floor. (But maybe that’s just one of my crotchets and other people don’t even notice bindweed. I can always hope). 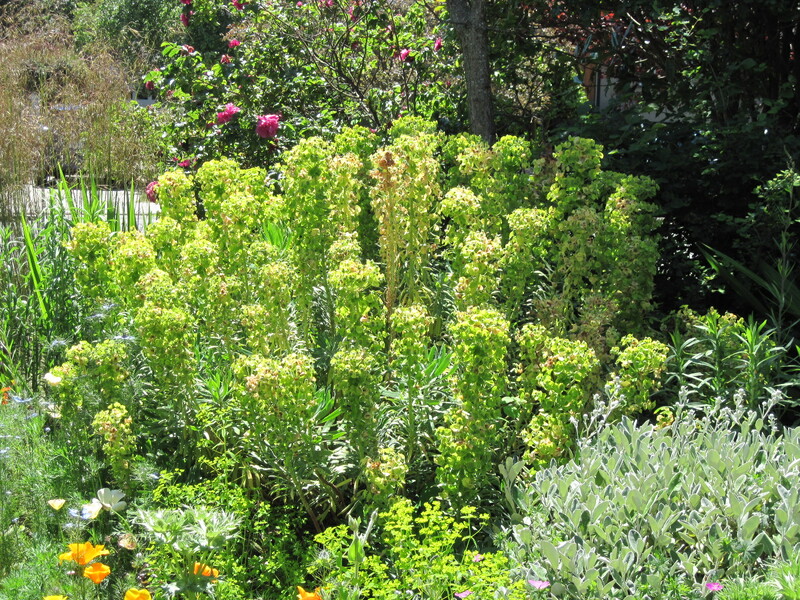 Right now I’m thinking I had better come to grips with “deadheading” Euphorbia characias subsp. characias “Humpty Dumpty” (yes, that really is its name, both the repetitious Latin moniker and the cutesy variety name). It blooms hugely all spring. In June, the flower heads begin to take on a tawny look, and if you are near the plant on a sunny day, you hear crisp little pops. “What’s that?” you think. It’s the euphoria’s seed pods bursting and shooting seeds all over the place, resulting in a crop of little seedlings (blue-green 1/2-inch long leaves) that need to be pulled out before they grow into 4′ x 4′ Humpties. Really.